The best administrators are those who welcome conversations and new ideas, collaborations, and support. 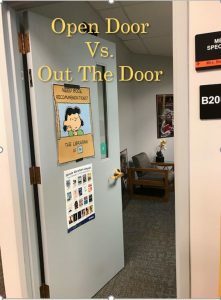 Many school administrators accomplish this lofty goal by instituting an “open door” policy where teachers and students can feel free to come in if the door is open. 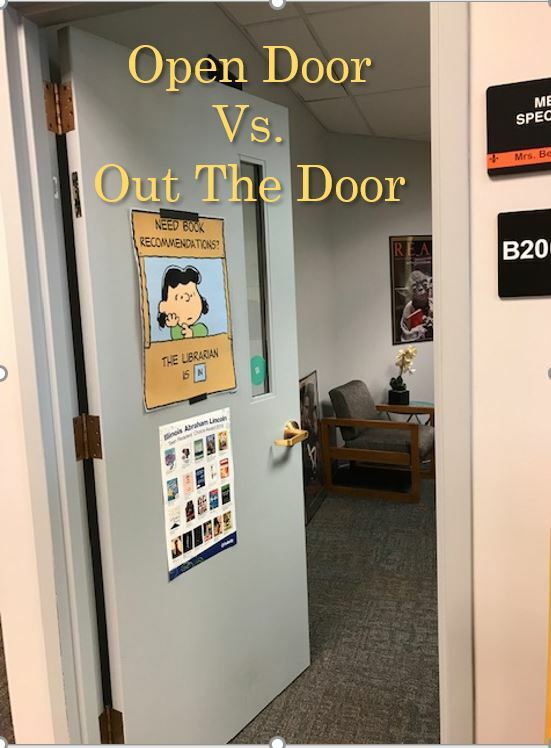 A 2012 study by Joseph Klein found that “transparency contributed to mutual trust and cooperation within school staffs.” The “open door” policy is one that I have always implemented in my own office, but recently I have begun to switch my mindset to more of an “out the door” policy. A place of trust, cooperation, and collaboration is the goal of any library. My office space is no exception to that thinking. The traditional view is that teachers or students will come to you when they need you. If your door is open, you can feel free to come in and sit down. This policy has worked for me for a long time, but recently I began to question how the best collaboration and conversations in planning happen. I started to wonder if more meetings and conversations would develop if I was out of my office and moving through the building more often. To quote one of my favorite J.R.R. Tolkien lines, “It’s a dangerous business, Frodo, going out your door. 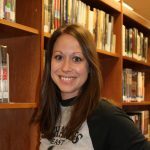 You step onto the road, and if you don’t keep your feet, there’s no knowing where you might be swept off to.” Literally the idea is to leave my office and my controlled way of planning and head out into the world of a busy high school. Not knowing where a conversation might take you into working with a student or a teacher can be exciting and liberating. Walking around the shelves and LRC spaces, checking in with classes and teachers that were already here working. Perusing the halls to common teacher areas like the commons, teacher lounges, and mail room. Calling on a few teachers each week that I already have established relationships with, planning ahead so they knew I would be coming to walk through and help as I could. Moving through the cafeteria, commons, and outdoor seating areas where students are hanging out. A seemingly random “How’s your day?” can turn into a much larger conversation. Since beginning to experiment with this “out the door” policy I have initiated countless conversations and started working on 3 new projects with teachers. I will continue to work on being creative with new ways to get out during the day. In a time when advocacy is at the top of many of our minds, it is extremely important to show teachers, administration, and students how we support our students and their learning. Getting out and being the initiator can be challenging, but the exciting benefits far out-weigh the obstacles.